My roomie and I after a particularly festive game of mud volleyball. Pardon the sports bra. The good: The University of Kansas has a large and oh-so-hilly campus. My freshman year I heard a rumor that a P.E. class wasn’t required because simply getting to class was a workout. I don’t know if that’s why a P.E. class isn’t required, but it certainly is true. People frequently made the joke about having to get to class going “uphill, both ways.” Even having a bus pass to get you around campus didn’t mean that you escaped frequent 10-minute hikes before each class. I often showed up to classes sweaty, in need of a cool down. As far as a real fitness routine went, I didn’t have one. I’d take up running, fleetingly, here and there. I’d do a Paula Abdul DVD with my college roomie on occasion, and she and I would go on speed walks together and jabber like crazy. But I honestly didn’t need a formal fitness routine because I stayed in awesome shape just walking and getting to class. When I was a 20-minute walk from campus, I never got a ride like some people did, even in the cold and rain. So when you’re speed walking to and from campus (I was always at the risk of running late because one more minute of sleep was always important) for a total of at least 80 walking minutes a day PLUS walking between classes? Yeah, you’re kind of covered on the cardio front. I avoided the rec center like the plague because it was old and kinda gnarly. When my brother got to college, we’d play racquetball and tennis, but hitting the weights? No thanks. An awesome shiny new rec center was built my senior year though, and because I’d been a student (and paying for its construction) for four years, I had privileges to use it after I graduated, which I took advantage of for a couple of years until I moved out of town. The bad: I spent some of the first year in college as a SMOKER. Even now I can’t believe I ever smoked. So yeah, my food decisions in college weren’t the healthiest. But at least I was forced to be active just getting to class. 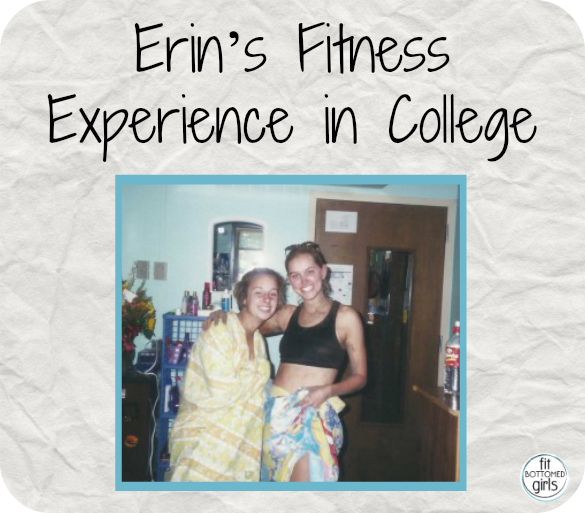 Great article on college eating and exercise. My daughter recently graduated and even though she was on the golf team she still gained weight. The food offered at colleges are not very healthy. They do have a few healthy choices but it seems to be more about making money off the college students. I look forward to reading more of your blog posts!